Last year, Vivo unveiled the Vivo V11 and V11 Pro (review) with dewdrop notches in India. Now, the company is planning to unveil its next-gen V series offerings called the Vivo V15 and V15 Pro in the country at an event on February 20th. Ahead of the launch, 91mobiles recently revealed that the upcoming phones will sport 32-megapixel selfie cameras. And just yesterday, we brought you the first promotional poster of the upcoming handset that revealed that the phone will go up on pre-orders starting February 15th. Now, we are back with detailed specifications of the Vivo V15 Pro. 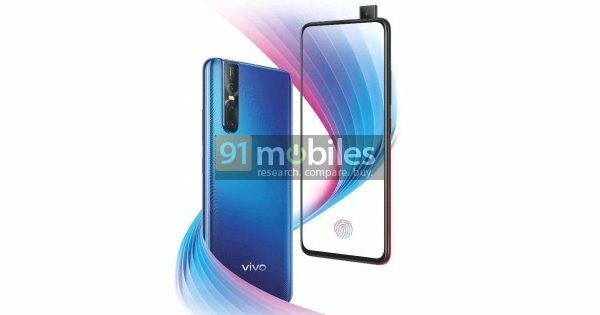 According to a company employee who wishes to remain anonymous, the Vivo V15 Pro will sport a Super AMOLED display, but there’s no word regarding its screen size. Notably, it will be one of the first smartphones to be powered by Qualcomm’s Snapdragon 675 processor, which was unveiled last October. For the uninitiated, Snapdragon 675 is an 11nm SoC that promises to deliver smooth gaming performance. The processor is paired with an Adreno 612 GPU, which is touted to deliver better graphics rendering capabilities. It’s worth mentioning that Xiaomi’s upcoming Redmi Note 7 Pro is also expected to utilise the SD675 chip. Moving on to the camera specs, our source suggests that the V15 Pro will be capable of producing images with 48-megapixel resolution. Explaining further, the source mentioned that the phone will be capturing images in 12MP resolution and will make use of the pixel binning technology to capture 48MP snaps. This leads us to believe that Vivo will be making use of Samsung’s GM1 sensor, which is also present on the Xiaomi Redmi Note 7 (first impressions). Furthermore, we’ve learned that the primary shooter will be accompanied by two additional cameras at the rear – 8MP + 5MP. The triple-camera setup will also come with Super Autofocus capabilities. We can also confirm the fact that the phone will indeed offer a 32-megapixel selfie camera. As for the design, the Vivo V15 Pro will boast an all-screen fascia with an under-display fingerprint reader, and narrow bezels all around the display. The smartphone will sport a pop-up selfie camera. The triple-camera array of the phone at the rear will be placed vertically with a dual-tone LED flash. Lastly, the handset will offer rounded corners and a curved back. As we mentioned yesterday, the Vivo V15 Pro will be available for pre-booking in India starting February 15th, as per our sources in the retail chain. The phone will be offered with launch offers in partnership with the likes of Bajaj Finserv, HDFC Bank, Jio, and HDB Financial. Lastly, the smartphone is expected to be priced around Rs 25,000 in the country.